My husband, Mike, is an engineer at a chemical company in Texas. I have learned that there are two types of people in this world: (1) engineers and (2) everyone else. Engineers are their own breed who speak a strange foreign language that no one else but other engineers comprehend. Don’t get me wrong, it is based in the English language and follows the syntax of English, but the average lay person tends to cross his eyes whenever and engineer talks about his/her job. I call it “brain shut down.” It is the body’s natural response to “engineer-ese” so that our neurons don’t explode and our grey matter doesn’t shrink in trying to wrap our non-engineer brains around whatever it is the engineer said. This necessary introduction about engineers s to lead up to the fact that my girls (ages 11 and 12) are going to “Take Your Child To Work” Day with Mike. 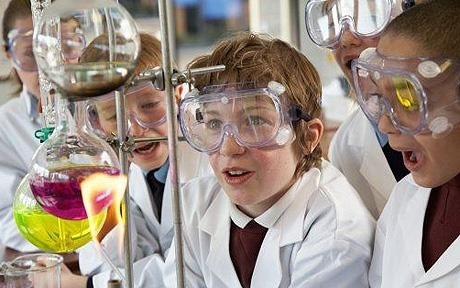 They are very excited to go, because really they have no idea what a chemical engineer does. (I just tell them Daddy makes plastic and goes to meetings with lots of PowerPoint presentations). The planner that he is, Mike sent me the schedule for “Take Your Child To Work Day.” In addition to “Science is pHun” sessions, the girls will get an overview of the company’s operations and jobs. They will see videos on safety, learn about careers in the field, and even win prizes. So, I wondered what “Take Your Child To Work Day” would look like for a stay-at-home parent if we gathered together several parents and their children. Here are the events and activities I came up with for our big day. I tried to make it as authentic as possible to the job. No glossing over the demands and joys of being a domestic engineer. 8:00 Overview of Operations (play video of Mr. Mom with Michael Keaton). Group A: Bathroom Essentials (includes scrubbing toilets and walls and floors if necessary, shower soap scum 101, and special techniques for scraping toothpaste off mirrors). Group A: What in God’s Name Are We Having for Dinner? (includes quick thawing techniques, recipe modifications, cooking for five people who do not like or eat the same things ever). Of course, this is a draft. If anyone has anything to add to the schedule, please feel free to throw out your suggestions! Funny, funny, funny and true, true true! oops – that was supposed to say sign me up – not single up! HaHaHa …. Love this. Being an engineer and a Mom (and formerly a stay-at-home Mom), I can tell you the jobs are not that different. The lingo may change but in both environments you are often cleaning up other people’s messes, negotiating with “terrorists,” presenting to blank stares, and just trying to find a moment of peace to yourself to get what you really want to get done! Thanks Cara … I will forward a pic of your little sweetheart in her hard hat and flame retardant clothing! That sounds great, Jackie. I thought you would get a kick out of it. Oh, Cara, this is too funny! Hi Cara – This was great! Wish they had this when I was little. Loved visiting Dad at work, but never really got to see behind the scenes. The shop was like his garage – smelled of grease and oil and tools. Better than any perfume! This blog reminded me of the Roseanne episode where Roseanne teaches home ec for a day.